This long-awaited CD reissue from 2002 was remastered with three bonus tracks added. These aren't duff bonus tracks, either; "Fracture" and "Starless" are nothing to sneeze at, although despite my opening comments, "Fracture" here is not one of my favorite versions. Some fans were disappointed that in the remastering process the decision was made to keep in certain overdubs of Eddie Jobson on violin and piano, but it doesn't bother me any. No, my only complaint with this release is that I think I'm starting to get overloaded with this stuff. There are too many KC live performances that I find so good that I have to call them "essential" - I'm going to have to raise my standards or something before my opinion on these recordings becomes so fanboyish as to be completely worthless. 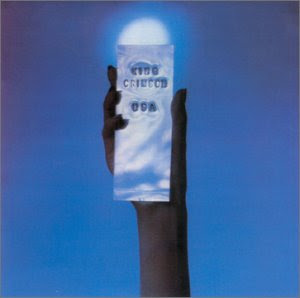 b. I'll begin by divulging that this was one of the first King Crimson records I owned, lo those decades ago. Next, I'm gonna say that I haven't listened to it since the live CD glut of the '90s. Then, I'm gonna go so far as to say that after listening to all those live recordings since, and then revisiting this one, these are the definitive versions of "Larks Tongues in Aspic part 2" and "Exiles". "Easy Money" also runs a tight contest with one of the versions on the Great Deciever box. Everything in the mix is nearly perfect. Wetton's bass is thick with distortion, the violin and guitar are completely aligned and the tag team and dual mellotron action is astounding. I don't think anything within Great Deceiver touches these. To seal the deal, Bruford is up in the mix and on his game, performing hitherto unknown tricks and spells in the percussion department. Months after I got this and listened to it a zillion times I found Larks Tongues in Aspic, and noted then that the live versions were better. Listening now, with much more to compare to, I'd still say these are the best recordings. If you act now (as opposed to the dark days of vinyl or resorting to a cheap Russian CD boot) you can get the USA mini-LP which also features timeless hits like "Fracture" and "Starless". Here again, the mix and recording are so near perfect its hard to resist calling them definitive, but I know I have favorite versions of these elsewhere. I'll admit its a bit reminiscent and perhaps fanboyish, but finding these re-issues of the original live King Crimson albums reminded me of what awesome albums they are. Its no wonder I've been grabbing every other live recording I've found since, trying to match the initial feeling of hearing this band live. This CD may stand as obligatory to an actual young person's guide to King Crimson, although I'm sure any of us who would take it upon ourselves to compile such a guide would do so differently than any other. c. The posthumous live effort of the Larks'-era King Crimson, and quite simply, one of the great live album documents to emerge from the 70s. Relative to the other archive releases available from this era of King Crimson's history, I find the sound is best here, probably since this was expected for an imminent release. The American audience, as noted by David Cross in his notes for The Night Watch, is considerably less subdued in their fervor than the Dutch audience of that performance. Aside from these differences, I was struck by how largely consistent the basic execution of each song remained across performances. For example, Bruford's percussive crashes opening up "Larks' Tongues in Aspic pt. 2," Wetton's final "Ooohhh" in "Exiles," and Fripp and Cross handing off the mellotron baton in the final lap of "Exiles." The only comparatively lesser moment on USA (and even then, by no means bad) is "Easy Money," which starts off strong but gradually trickles downward in momentum after the verses and gets cut off before the song reaches completion. Still, if you can only get one live effort from this line-up, then this classic is the one that gets my vote: remastered now for superb sound, with performances catching all the fire that one of the finest rock groups can dish out.